Nowadays those of people who own a stainless steel cooler (or any other sort of metal cooler) emphasize their style and distinguish from the crowd like no one other. Coolers made of stainless steel (or other metals) will never become old-fashioned, vice versa, with the passing of time they become more and more unique and stylish in comparison with other usual coolers models. Actually nowadays you will hardly ever find a great variety of metal coolers to purchase, if don’t take into account various shops that offer antique things. Just think about great old Coke coolers or Corona coolers that are almost impossible to purchase in the modern world. It is very sad that a lot of manufacturers change their production to plastic. To some extent it is rather fair and deliberate decision, because the difference in price of metal and plastic coolers is really significant. But nevertheless, some of such coolers are still manufactured, and, God, they are AWESOME! TOP Stainless Steel and Metal Coolers Available. Let’s Compare! 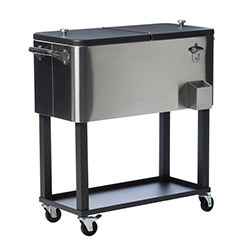 Our List of TOP 5 Metal Coolers and Stainless Steel Ice Chests. In this article our team has picked up for our lovely readers a list of TOP 5 metal coolers and stainless ice chests to purchase. We composed this list by basing on such characteristics as coolers’ durability, ratio between value and price, performance and, of course, their STYLE. Options presented here really have a title ‘best of the best’ options available nowadays. First participant of the TOP metal and stainless steel coolers is this Coleman 54-quart steel cooler. Frankly speaking, it is one of those coolers nowadays, that has a high demand among buyers. This steel cooler can boast of great combination of high durability, qualitative construction and unrepeatable old-school design. You can find it in a great variety of available sizes and also choose it in one of six different color options available at the world market. We want to pay you attention on one thing that has disappointed us when we were considering this option. The generation of these Coleman coolers differs from the old original ice chests by their structure. The manufacturers of this new Coleman coolers lineup added a lot of plastic in their production. 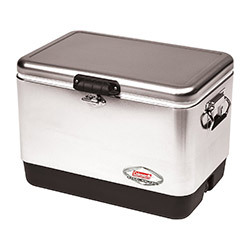 The steel core of the lid and body of the coolers is incorporated with durable RVE plastic. 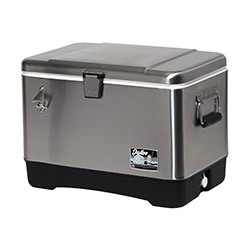 Of course, this is also very heavy-duty material that only adds the durability to coolers but these coolers differ from the original Coleman ice chests that were completely made of steel. One great advantage of such structure is coolers price. You can purchase such cooler at the about $100 that is very attractive price for such products, taking into account that you will get heavy-duty, steel-cored cooler. The size of the Coleman 54-quart cooler is 25” x 17” x 17” and its capacity allow you to put in it up to 82 cans. Speaking about ice retention note that these coolers will not give you such tremendous results as coolers with premium rotomolded designs will give. Anyway, taking into account the price tag of these coolers (that is significantly less than rotomolded coolers) such good options as the Coleman Steel Belted cooler described in this paragraph can be a worthy replacement to high-end coolers. These coolers will be much better variant than cheap, basic coolers and will hold an ice up to day or more. Second participant of our TOP list is Igloo 54-quart Stainless Steel Cooler. This option is a good representative of eternal classic with stylish unique design and long lasting features. The capacity of this cooler is the same as previously mentioned cooler has, but its size is smaller. The measures of this Igloo cooler are 24.45” x 16.45” x 15.87. This cooler also has less plastic and more steel in its construction in comparison with Coleman Steel Belted cooler. Of course, because of this fact, its price raised up to two times. Expectedly, isn’t it? 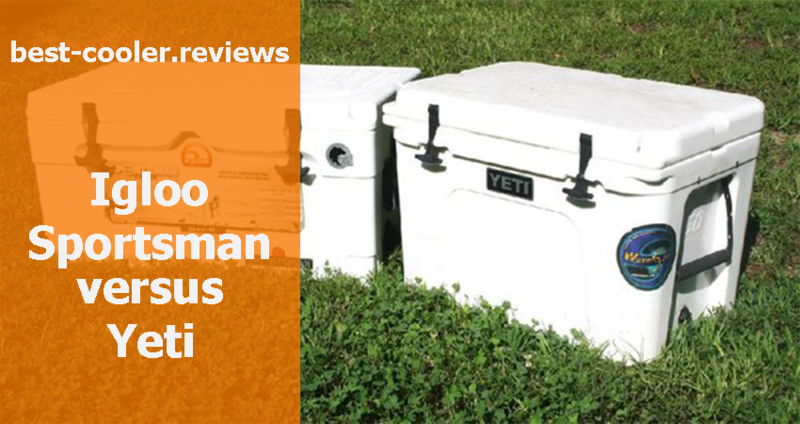 The Igloo manufacturers claim that this cooler can hold an ice up to 4 days, but users’ reviews differ from these terms. Maybe the term of four days can be true with not such hot weather as at summer. 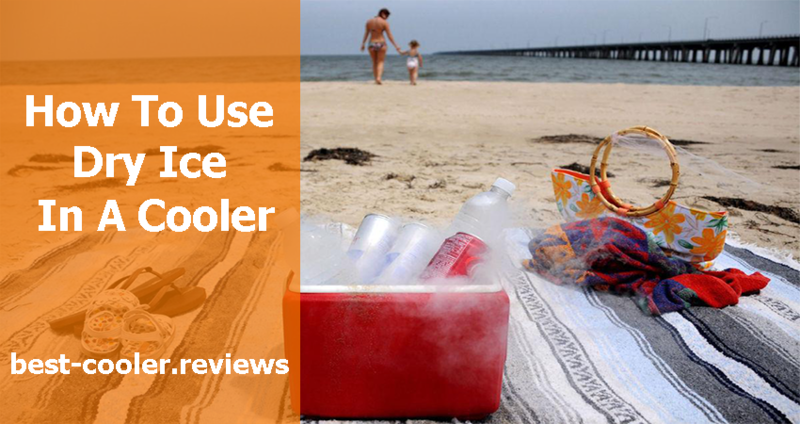 Users write in their reviews that under the scorching sun rays this cooler is able to hold an ice up to day and a half. Generally this Igloo Stainless Steel cooler is a good option to purchase with qualitative features and the most stylish design among all representatives in our list. Legendary Corona Steel coolers have back to our modern life in the form of amazing novelties with better quality and excellent performance. The CORIC-54 stainless steel ice chest is a high quality option with durable construction and very stylish look. The measures of this cooler are 25.5” x 16.2” x 16.8” that will be enough to put up to 85 cans with ice without any problems. But keep in mind that it may be rather difficultly to carry up this cooler when it is completely filled. 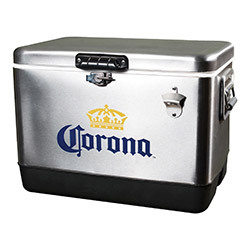 Many people are little suspicious to novelties like this, but in the case of the Corona Ice Chest you don’t have any reasons to it. High quality, stylish look, great durability. All that you need from your cooler to catch admired glances. Will be an excellent option for barbecue with friends or party outdoors. 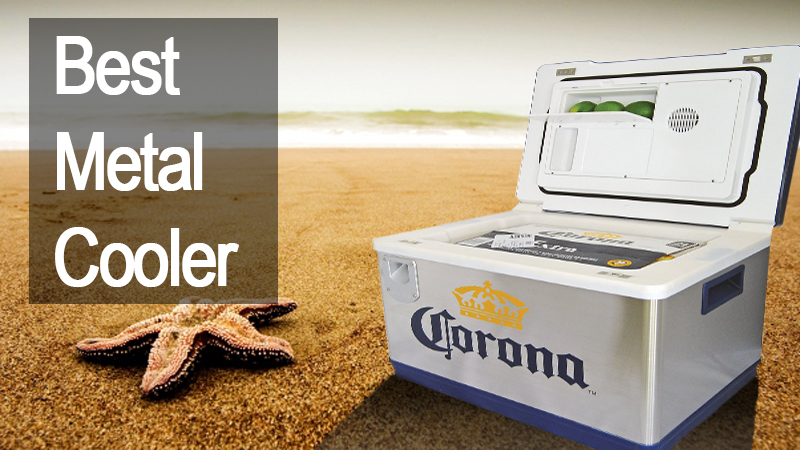 For more additional information about Corona coolers you can go right here. One of the most interest coolers in our list is this stylish and convenient option. This cooler has achieved a very high popularity level because of it stylish look, durable construction, incredible maneuverability and portability. This amazing cooler is equipped with special bottom storage shelf and rolling cart that are appreciated by its users most of all. This cooler can become a perfect option for weekends grill at your backyard. Style and quality will make it your favorite for many years. The capacity of this cooler is 80-quarts, that allow you to put into the cooler more than enough beverages you and your friends need. With the durable wheels and such additional features as drainage plug, bottle opener and hinged double sided lid this cooler is one of the most convenient options to use. This cooler is made of extremely durable high grade 304 stainless steel. The specially designed bronze speckled finish of legs and lid of the cooler adds to cooler’s design style and unique. This cooler can be surely named as “cooler for men”. With durable design this cooler reminds of incredible strength and force. Lund 4400 is one and only cooler made of the diamond plate metal and constructed with 0.06” aluminum for excellent rust-resistance. The Lund brand is well known for their high-quality boats for fishing. Take into account this fact and put aside all doubts about its quality. Definitely good product from the famous manufacturers. The size of this cooler is 25.5” x 21” x 13” that is the same as other options in our list have. 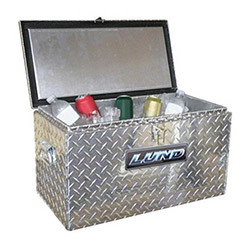 The price of the Lund 4400 is rather high (here’s an Amazon listing), but in fact the most expensive part of this cooler is its diamond plate. It influenced on its price greatly. 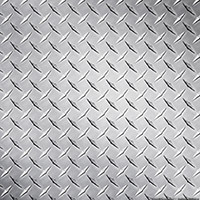 Beside the unique stylish diamond plate the price of this cooler is caused by its durability, toughness and resistance to all weather conditions. This option will become a perfect stylish and long-lasting cooler with excellent characteristics, which you can brag to your friends. At the end of our article we want to make a conclusion about all variants that have been listed above. Each of the previously mentioned metal and stainless steel coolers was selected by our team thanks to its quality, durability, construction and, of course, STYLE. All these models will provide you with highest-quality characteristics, good performance and long period of service. We have already mentioned in our article that these coolers are an excellent variant between cheap basic coolers and premium-class coolers like Orca or Yeti or maybe some of those coolers with their rotomolded construction and appropriate price tag. Eternal classic design and affordable price are the main characteristics of all previously mentioned models. Steel will never become something old-fashioned, so by purchasing one these coolers you will never regret about your choice. Time is running, but the classics remains classics.